One of the most recognized artists of the twentieth century Max Ernst was a proponent of Dada and one of the founding members of Surrealism. Born in Germany, but spent the greatest part of his life in France, Ernst was also one of the first artists to apply Sigmund Freud’s methods in his practice. Influenced by philosophy, literature and psychoanalytic, his practice was always closely bound to technical experimentation, from his first collages through the development of such techniques as frottage, grattage, and decalomania. 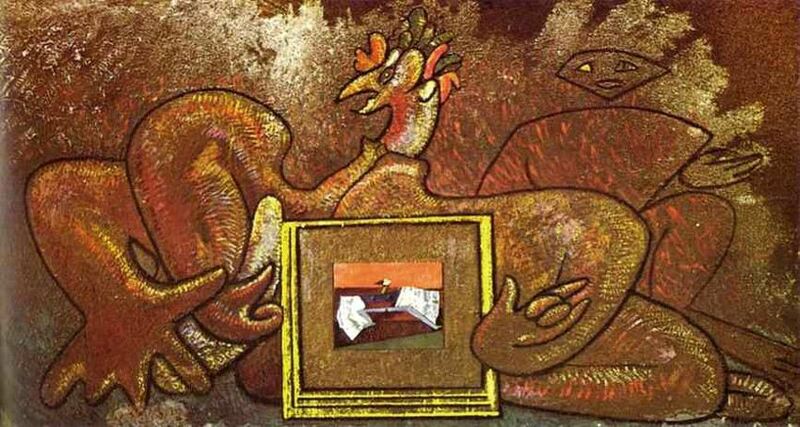 One of the most common symbols in his strange, evocative paintings, drawings and sculptures is a birdlike creature called Loplop. Max Ernst was born in a middle-class Catholic family, in the spring of 1891 in Brühl, a town in the Rhineland of Germany. He was the oldest son and the third of nine children of Louise Ernst, née Kopp, and Phillip Joseph Ernst. His father was a teacher at Brühl’s Institute for the Deaf and Dumb and an amateur painter who had a reputation for being a strong disciplinarian. Max was encouraged by his father’s interest in art to take up painting himself at an early age. Ernst’s memories of his childhood at family home were significantly dynamic and picturesque, and they provided him with many subjects for his later oeuvre. Max received no formal artistic education, instead, he enrolled at the University of Bonn in 1910, where he studied philosophy and abnormal psychology, which also influenced his later work. During his studies, Ernst visited asylums and became interested in the art of the mentally ill as a means to access primal emotion and unconstrained imagination. Focused on courses in the history of art, psychology, philosophy, philology, and literature, the artist became increasingly preoccupied with painting in 1910, producing sketches in an idyllic garden landscape at the Bruhl castle, as well as the self-portraits and portraits of his sister. 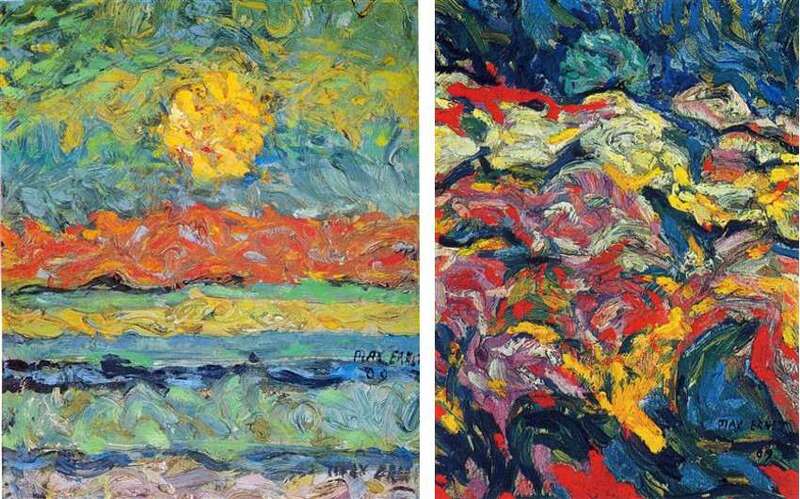 In 1914, he completed his studies and decided to devote himself to art. In 1911, Max Ernst met August Macke, an expressionist painter and one of the leading members of the Die Rheinischen Expressionisten (The Rhineland Expressionists) group of artists. Max, who became a friend of Macke, became actively engaged with the group of artists and began writing art criticism for the newspaper Volksmund in Bonn. A year later, Ernst visited the Sonderbund exhibition in Cologne and was influenced by the paintings of Pablo Picasso, Paul Cézanne, Edvard Munch and Vincent van Gogh. In 1912, Ernst exhibited his work for the first time with The Rhineland Expressionists, as well as at the First German Autumn Salon at Herwarth Walden’s Sturm Gallery in Berlin. In 1913, he participated in several collective shows. The same year Ernst met French artists Guillaume Apollinaire and Robert Delaunay and traveled to Paris. In 1914, Ernst met a German-French multidisciplinary artist Jean Arp in Cologne. The two befriended and their meaningful artistic friendship lasted for five decades. 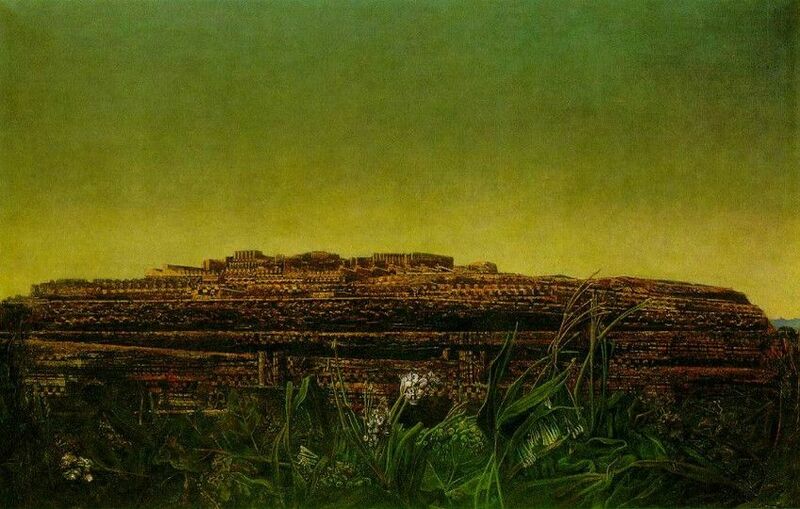 Max Ernst was drafted and served in the German army during the Great War both on the Western and the Eastern front. Upon his return from World War I in 1918, Ernst began to develop his own unique and inimitable style convinced that the traditional approach to art was no longer up-to-date. One year later, Ernst visited a Swiss-German painter Paul Klee in Munich and studied pieces by the Italian artist Giorgio de Chirico which profoundly influenced the surrealists. 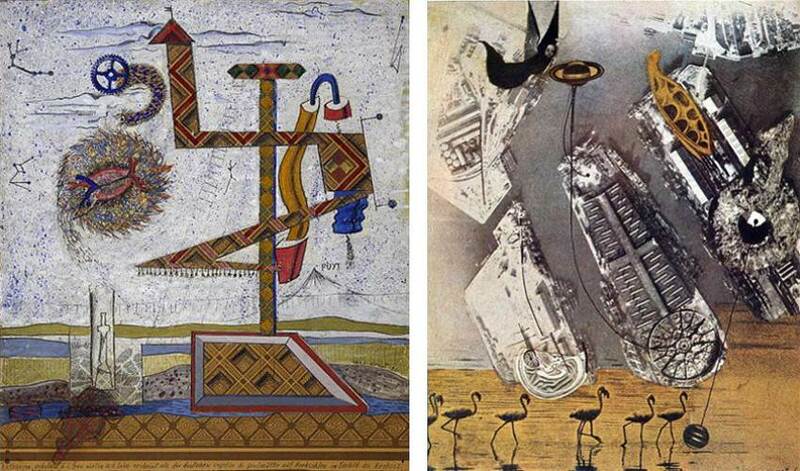 The same year, Max Ernst made his first collages, a technique of an art production where the artwork is made from an assemblage of different forms, which would become one of the main technique in Ernst’s practice in the following years. In 1919, Ernst, Arp, social activist and artist Johannes Theodor Baargeld (Alfred Emanuel Ferdinand Grünwald), and several colleagues founded the Cologne Dada group. Dada or Dadaism was an art movement of the European avant-garde in the early 20th century which dealt with the nullification and mockery of the established world. It was the precursor to the Surrealist movement. From 1919 to 1920, members of the Cologne Dada group published various Dadaist publications including Der Strom and die Schammade. In 1920, Ernst, Baargeld, and Arp organized a controversial Dada exhibition which focused on nonsense and anti-bourgeois sentiments. Held in a public restroom, the show was closed by the police due to obscenity, but it was re-opened when the charges were dropped. One of Ernst’s Dada collages and photomontages produced in this period was Here Everything Is Still Floating (1920) made of cutout photographs of insects, fish, and anatomical drawings ingeniously arranged to suggest the multiple identities of the things depicted. He made a series of collages using school textbooks, educational placards and mail-order catalogs as the main sources of materials to form bizarre juxtapositions of images. After demobilization in 1918, Max Ernst married art history student Luise Straus, whom he had met in 1914. They got a son Ulrich “Jimmy” Ernst on 24 June 1920, but their marriage ended in 1922 when Ernst moved to Paris and left behind his wife and son. Before long, the artist became a friend of a French artist André Breton, who organized an exhibition of Max’s collages at the Galerie Au sans Pareil, Paris in 1921. With Breton and another French artist Paul Éluard, he was involved in Surrealist activities. In 1922, Ernst entered France illegally after failing to get the required documents. In the suburb of French capital Saint-Brice-sous-Forêt, Max Ernst settled into a ménage à trois with Paul Éluard and his wife Gala. 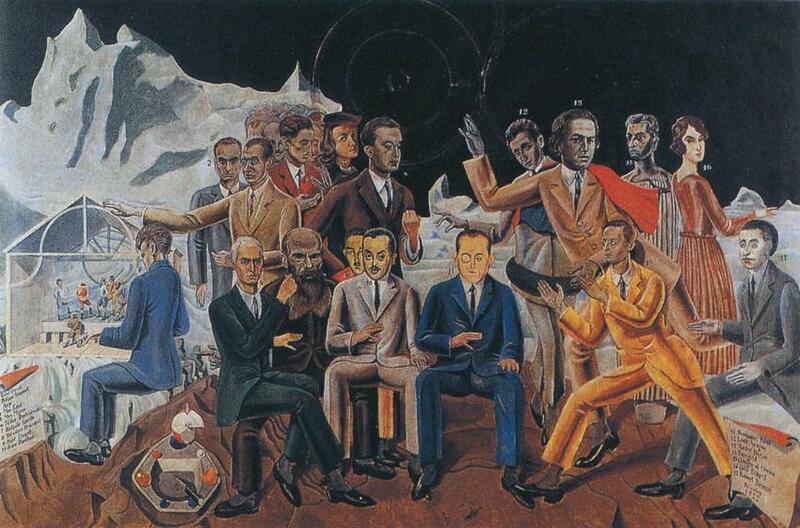 The same year he painted A Friends’ Reunion, where he depicted himself and all his associates. 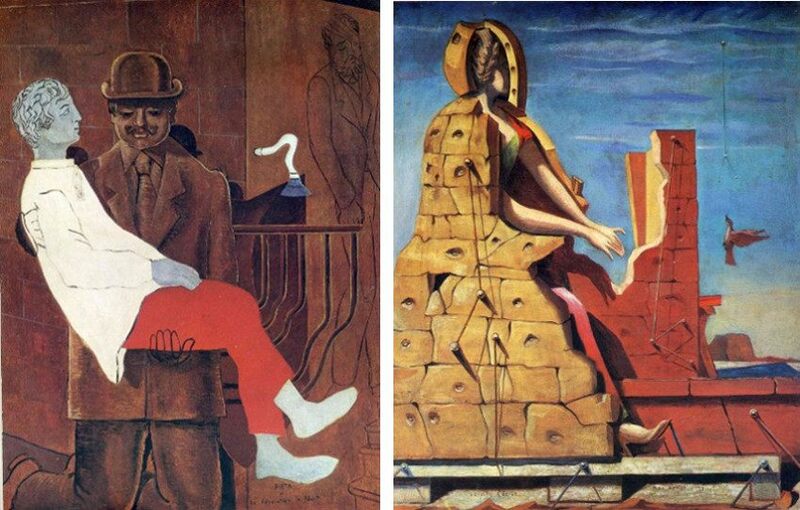 In his works from that period, Ernst combined painting, assemblage and collage in large-scale pieces with enigmatic plots like in Oedipus Rex (1922) and Teetering Woman (1923). For a brief period in 1924, Max, Gala, and Paul visited Monaco and Saigon, a city in southern Vietnam, where they decided that Gala would remain with Paul, so the German painter returned to Paris and opened a studio a year later at 22, rue Tourlaque. 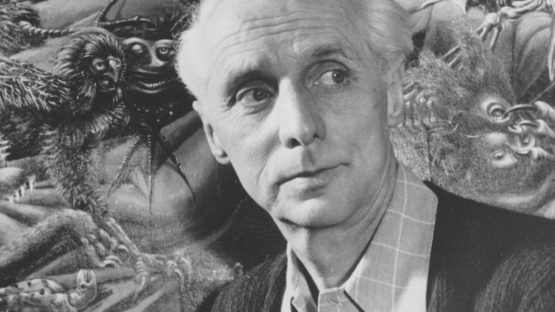 The same year Max Ernst became one of the founding members of the Surrealist group. In 1927, he married Marie-Berthe Aurenche, the sister of movie writer Jean Aurenche. 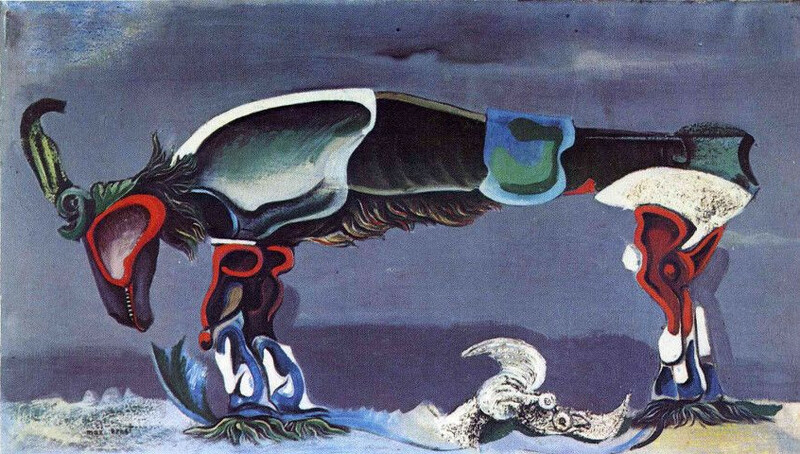 In 1925, Max Ernst discovered the technique frottage. It is a method of creation in which one takes a pencil or other drawing tool and makes a “rubbing” over a textured surface. The drawing can either be left as it is or used as the basis for further refinement. 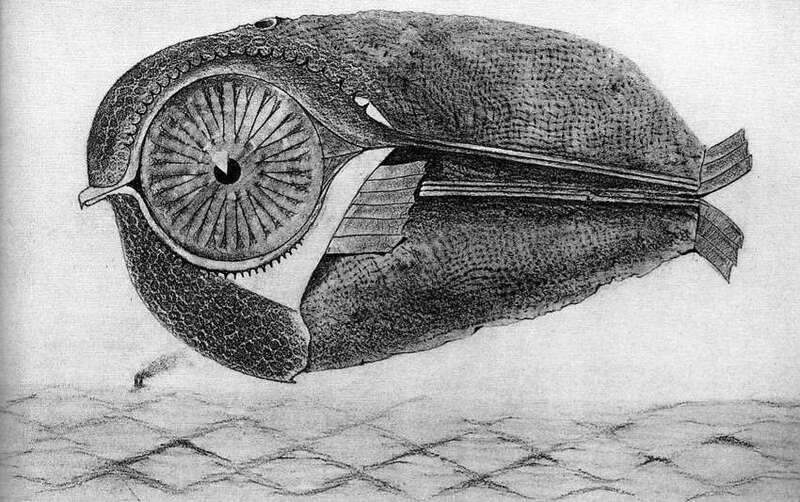 Ernst’s series of frottages was published in his book Histoire Naturelle in 1926. With Joan Miró’s help, Ernst employed the grattage, a technique in painting in which (usually wet) paint is scraped off the canvas. His most famous painting in which he used the grattage is Forest and Dove that depicts a nocturnal scene of a forest of bizarre, abstract trees. One more technique Ernst explored was decalcomania, a decorative technique by which engravings and prints may be transferred to pottery or other materials. Some of the most common symbols in the painter’s oeuvre are forests and doves as well as a fantasy birdlike creature called Loplop. It appears in collages of Ernst’s work, such as Loplop presents André Breton, and it is also used as a form of narration and self-commentary like in Ernst’s books of collages La Femme 100 têtes and Une Semaine de bonté, both produced between 1929 and 1939. The artist in the shape of Loplop appeared in his works in person, either in a caption or pictorial form, throughout his life, like in painting Loplop Introduces a Young Girl (1930) and Loplop Introduces Loplop (1930). The following year the artist collaborated with a prominent Spanish surrealist painter Salvador Dalí and appeared in the 1930 film L’Âge d’Or, directed by self-identifying Surrealist Luis Buñuel. Ernst’s first solo show in the United States was held at the Julien Levy Gallery, New York in 1932. Max Ernst made his first sculpture in 1934 using improvised techniques in this medium just as he had in painting. In 1936, Ernst divorced Marie-Berthe Aurenche. 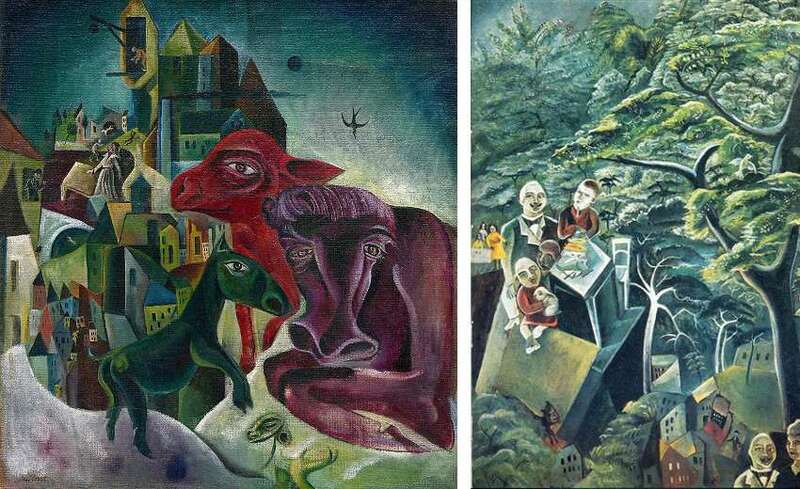 Subsequently, he left the Surrealist group and went to Saint-Martin d’Ardèche, Southern France, with his lover, the artist Leonora Carrington. They supported each other’s artistic talent and vision and collaborated on several projects until Ernst’s arrest by the Nazis shortly after their occupation of France. Thanks to the intercession of Paul Éluard and several other friends, he was released a few weeks later. In 1938 the American art collector, Marguerite “Peggy” Guggenheim acquired a number of Max Ernst’s works, which she displayed in her new gallery in London, UK. In 1941, Peggy helped him to escape to the USA. He left behind his lover, Leonora Carrington who suffered a complete breakdown that resulted in her being institutionalized. Ernst and Peggy Guggenheim married in December 1941. From 1941 to 1945 Max Ernst lived in New York where together with other European emigrant painters, including Marcel Duchamp and Marc Chagall, helped inspire the development of Abstract expressionism and left a lasting influence on the development of American modern art. His works made in the USA reflect in a surrealistic manner the tragic social reality. 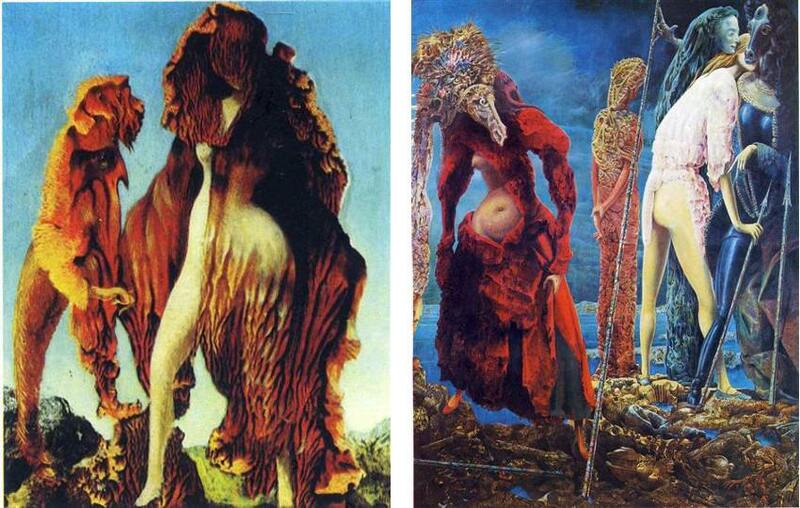 In October 1946, Ernst married fellow Surrealist Dorothea Tanning. From 1946 to 1952, they lived in Arizona, where Ernst got interested in sculpture and made many pieces mainly consisted of assembled objects of everyday use. In 1948, Ernst wrote the treatise Beyond Painting. One of the most important figures in the European avant-garde in the years after World War I, Max Ernst continued to produce innovative work in his late years. He experimented with numerous of the themes that had preoccupied him in the United States after his return to France in 1953. One year later Ernst participated at the Venice Biennale where he won the Grand Prize for painting, one of the art world’s top honors for painting. He became a French citizen in 1958. The Solomon R. Guggenheim Museum gave him a major retrospective in 1975, which traveled in modified form to the Musée National d’Art Moderne, Paris. The artist died on April 1, 1976, just a day before his 85th birthday. In the following years, his work continues to receive acclaim. Today, he is recognized as one of the Germany’s most important artists of the last century.